March 2019’s combined spending, at nearly $25 billion, is a healthy-looking sum, even though it represents a 24% drop compared with February 2019 and a 65% decline versus March 2018. 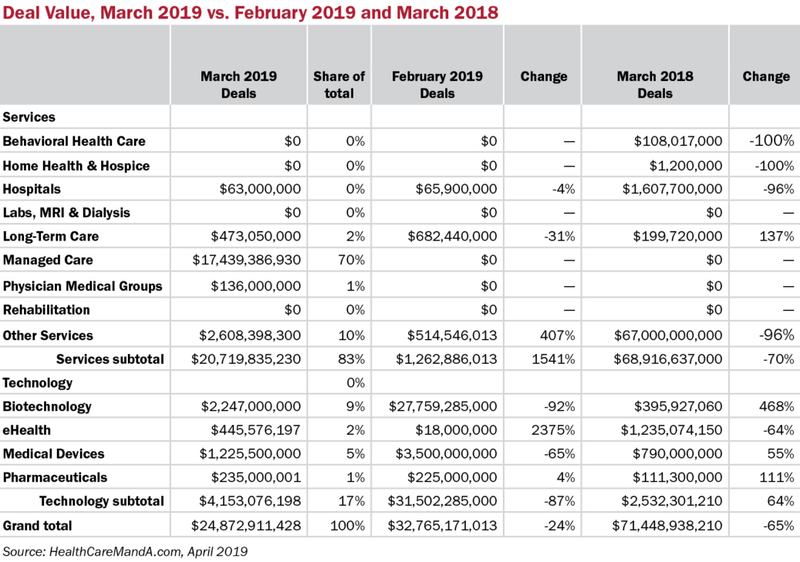 As usual, March 2019’s total is mostly the result of one deal—Centene’s (NYSE: CNC) $17.4 billion bid for WellCare Health Plans (NYSE: WCG), which accounted for 70% of the total. Without it, March 2019 would have posted a total of $7.5 billion and a 77% decrease from the previous month’s approximately $32.8 billion. And an almost 90% drop compared with the $71.5 billion in March 2018. Spending isn’t the real measure of the health of the healthcare deal market, as we say every month. Sources tell us they see stronger deal flow coming in the next two quarters, so we’ll have to wait and see. In the meantime, enjoy the sounds and smells of Spring. Money isn’t everything.